When you have a baby, everyone comes out with the cliches. ‘It goes so fast,’ The nights may be long, but the years are painfully short and. It is all so true. The first year for us has absolutely flown by. There is so much development in the first year, so many moments, so many firsts. 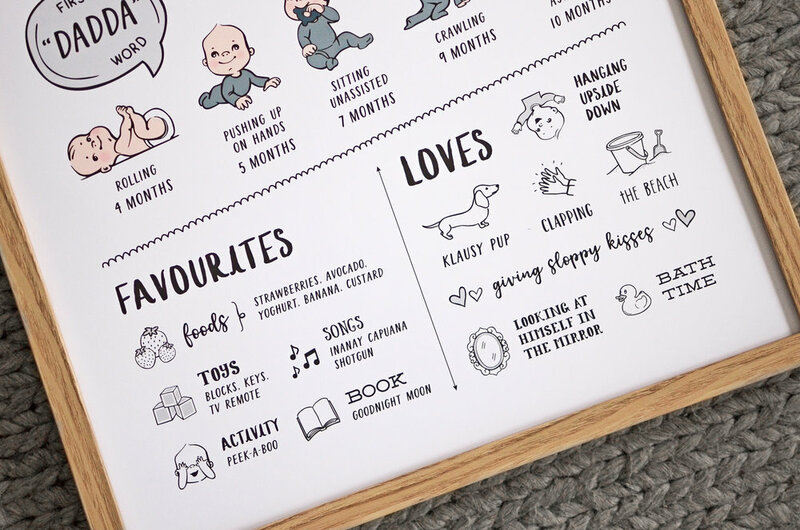 For Edmund’s first birthday I wanted to create him something personal that captured all those big moments and milestones that would become a keepsake we could look back on. I’d seen We had it displayed on an easel for his birthday party and now sits on the dresser in his nursery. If you would like you’re own milestone poster created, whether it be for a first birthday, first day of school or other occasion, simply get in touch, we would love to help you out.